Tag Archive | "Praecox Rainbowfish"
Praecox Rainbowfish (Melanotaenia praecox) are also known by tropical fish keeping enthusiasts as the Dwarf Rainbow, Dwarf Neon Rainbow, Praecox Rainbow, and Neon Rainbow. The Praecox Rainbowfish lives among roots, logs, and other vegetation in the swifter moving streams and tributaries that are adjacent to the main river channels, marshes, and swamps of West Papua, New Guinea in Indonesia. Praecox Rainbowfish are peaceful, active schooling fish that are known for their large eyes, deeply forked mouths, black or silver band that runs through their lateral rows of scales, and their two dorsal fins. Their bodies are generally a bright iridescent blue color with scarlet to reddish orange colored, translucent edged fins. The Praecox Rainbowfish or Dwarf Neon Rainbow is a great community tank species than can be kept with other similarly sized rainbowfish, danios, barbs, Characins, dwarf cichlids, gobies and relatively smaller sized catfish species like Corydoras. When kept in a single species tank they should be kept with at least 6 or more of their own kind and not mixed in with rainbowfish of other species. All rainbowfish do best in a densely planted aquarium with a sandy or fine gravel bottom substrate, a few river rocks, some driftwood or bogwood roots, and plenty of free swimming space. Melanotaenia praecox are egg layers that scatter their eggs over mossy substrates. In an aquarium environment, they breed freely and should be segregated to prevent inbreeding of species. Separate an adult pair by selecting a group and conditioning them in a breeding tank with plenty of live, frozen or freeze dried foods. When the females are noticeably plump and the males are displaying themselves to each other, separate the best looking pair and move them into a spawning tank equipped with a seeded air driven sponge filter, some fine leaved plants, Java Moss or a spawning mop and no aggregate. The water should be alkaline (pH 7.0), slightly hard, and at a temperature of 75-80 degrees F.
If you raise the water temperature slightly, spawning can sometimes be induced. The pair will lay several batches of eggs each day for a period of several weeks. The eggs are attached to the plants or spawning mop by a fine small thread. Because the parents are likely to eat their eggs, its best to remove each batch as they are laid to a rearing tank where they will hatch in about 7 to 10 days. After their eggs sacs have been absorbed, feed the tiny fry infusoria or liquid fry food until they are able to eat newly hatched baby brine shrimp . Praecox Rainbowfish usually produce larger broods than other species of rainbowfish. Praecox Rainbows have large mouths but their throats are narrow, so feeding them large foods is not advisable. A steady diet of high quality flake food mixed with fresh, frozen and freeze dried bloodworms , brine shrimp, daphnia , mosquito larvae, etc. will keep them healthy and disease free. 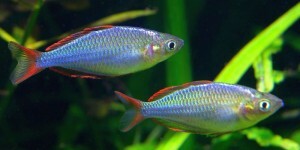 When available, Praecox Rainbowfish are usually 1″ to 2″ in size and are moderately priced.